It is with a deep sigh of relief that I report that I have been feeling pretty fantastic this past week, so, knock on Ikea composite, I think I'm done with the 24/7 hangover called morning sickness. At 14 weeks now, my biggest issues are waking up in the middle of the night to pee, food aversions, and clothes that don't fit me in the waist. My first trimester was rough. Some days I thought I might be dying. With my first pregnancy, I may have thought from time to time "oh this must be morning sickness" -- it wasn't. I had no idea how very real and debilitating nausea could be for a lady with child. I was blessed with so much help it brings me to tears when I think about it. I had parents and in-laws and cousins and neighbors and friends doing so much for me (and a ROCK of a husband). Accepting help can be very difficult for stubborn Type A's such as myself, but desperate times call for complete surrender. Want to know how to help a newly pregnant lady with a toddler? Come over and do her laundry, wash her dishes, or clean a bathroom. Take her child for the day, or even just stay and play with toddler for an hour while mommy sleeps. Give toddler a bath. Show up at her door with Powerade in two different flavors and check in with her via text to make sure she's drinking it. Bring dinner for her husband and child (and don't be offended if mom doesn't eat much of it). Pick up her husband's dry-cleaning. Pick up her prescriptions. Walk their dogs. Go to the grocery store for them. You get the idea. Not all pregnant women have family and friends as nearby and available as I do. If this is you, please reach out. Ask for help on your Facebook wall. Email the pastor at a local church, even if you don't go there. Call a neighbor that you don't know very well, but who seems nice and you always wave "hi" to. You NEED it. It's OK to ask for help. Make a list of things that others could do for you (laundry, dishes, carpools, watering plants, grocery list, etc.) and keep it by your front door, that way if someone pops in and asks what they can do, you don't have to come up with something on the spot. There are people who are willing and able to help you out, some who might surprise you. Dan came through my sickness phase a badass the same way he did after my C-section two summers ago. But even the most incredible people need encouragement. For Dan it was constant reminders that this was temporary and this was normal. Dan's biggest fear was that I was going to end up in the hospital (which is not entirely irrational) or that it was going to last all nine months (also not entirely irrational) or worse. It helped a lot to hear testimonies from other people who(se wive's) had been sick during their pregnancies, and see them alive and well now, with beautiful children to show for it; light at the end of the tunnel. I don't know about yours, but my man only operates full throttle when he has a certain peace of mind about our life. It was important to try to remember his needs too, even when mine were so demanding. 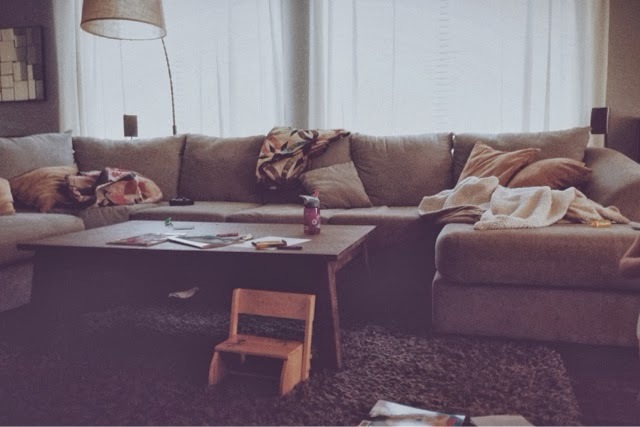 Both of the major common areas in our home are child-proofed enough to where the adult in charge can turn their back on Penny for short periods of time and rely only on only their sense of hearing to make sure everything is kosher. For the spurts of time that I had no help (mostly in the mornings), I literally lay half-asleep on the couch while Penny entertained herself, fed herself and watched TV. And I don't feel bad about it. I would wake up in the morning, nurse her (yes, still breastfeeding over here), and then use what little energy I had to: make a little breakfast plate for her consisting of a variety of non-staining finger foods and a sippy of water; set up a coloring area with washable crayons and dollar-store coloring books; set up a puzzle or other toy area area; close all the doors to all the rest of the rooms in the house; and turn on PBS kids -- before homesteading on the couch for three hours. I would, of course, with adrenaline, get up off the couch to change a poopy diaper or handle anything that went wrong, but for the most part I rested. I didn't even rise to clean up food spills -- that's what dogs are for. I know the theme songs by heart of every PBS Kids show between Curious George and Sid the Science Kid. When Charlie Rose came on, I knew it was time to refill my giant water cup and get Penny some lunch. There were some days when I felt guilty that my toddler was cooped up in a house with a lethargic mother, glued to the tv (sooooo much tv). But people, I'm telling you, it was survival, and it was temporary. And Penny is fine. We use all-natural doTERRA essential oils daily in our house. My first trimester I relied heavily on the DigestZen Blend to ease my nausea and intestinal issues as much as possible. When wearing a nightgown to and from the bathroom all day wasn't an option, I had to get over my I hate medication thing and take some drugs. I was on Zofran dissolvable tablets and Dulcolax. Not going to say I *loved* either of them, but they sure did help, a lot. I also found on-the-go relief from these Queasy Drops by Three Lollies, a gift from a friend. I had photo sessions from December that still needed post-processing, and high aspirations of doing our taxes early. I had tons of things I wanted to do with Penny to capitalize on the Arizona winter weather. I had blog post after blog post that I wanted to write. I wanted to have another garage sale. All of this had to get in the back seat, and I had to be ok with it. Welp, glad that's over. Thanks so much for the outpouring of support I had from all of you during my sick time. I hope to be able to return the favor or pay it forward for each and every one of you some day. What did you do to survive morning sickness in your pregnancy? Hi there! Love reading your blog about your beautiful family! I have a two year old and a four month old so I feel your pain on the morning sickness with a toddler. I had it on and off until about 25 weeks. My son thought that it was hilarious when I threw up. Wow, that sounds really hard. Happy to hear you are over the worst. What week did you start feeling sick? Hi Calie, I started feeling sick around 6-7 weeks, and it was the worst from 9-12 weeks. So happy that you are feeling better! I'm glad you were able to let go and ask for help. Surviving is a pretty good goal and you accomplished it! My mom has been a HUGE help as well. I'm down with a wicked sinus cold and she came over yesterday and took Annabel for a walk, did dinner, and bath time. It was awesome! We are so blessed! I'm 6 weeks along with our second (have an almost 3 yr old son) and the morning sickness is in full swing, UGH. With my first I was sick well into the second trimester. I think it eased up around week 16 or 17. Desperately hoping it's not that bad this time, or not that long anyway. Glad you are past it! Now I remember why I didn't want to have another baby for so long.